Rovio CEO Mikael Hed has announced in app purchasing for Angry Birds, with the Mighty Eagle making an appearance. The new bird is designed to help those stuck on levels, and will allow users to pay for an 'aid' while in the app. 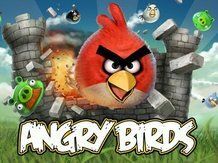 Announced at Nokia World, Angry Birds will be available on the Symbian platform from the release of the Nokia N8 onwards, and this is the first place the new Mighty Eagle will be able to be bought. When the Mighty Eagle is bought, users can select him in the app menu and a sardine can will replace the bird you were to be using. Once the can hits the game arena, a massive bird will come down and wipe out all in sight. However, three stars can't be gained this way, and if you want to use the Eagle again you'll have to complete the level you 'cheated' on in the traditional way. We're looking forward to finding out if this will be coming to the iPhone, Palm and Android platforms too - although we've yet to learn the UK price of the Mighty Eagle. And there's even a trailer to show it off too - which is far more fun than cheating your way through the 59p game anyway.